I joined Erin’s FREE (yes free!!) 2013 Block of the Month. Every year this very talented lady does a BOM and shares all of the patterns for free throughout the year. The only thing you have to buy is the center block for the quilt and it is a very reasonable $10. This year’s BOM is a Christmas themed quilt with appliqué and pieced blocks. Last year I tried to follow along in the “My Tweets” BOM that featured lots of peacocks and lots of appliqué. I didn’t even finish up block 1 before I fell off the wagon. I’m hoping that I’ll be able to keep up this year especially since some of the blocks will be pieced. I use a wash away embroidery stabilizer to prepare my fabrics for appliqué. 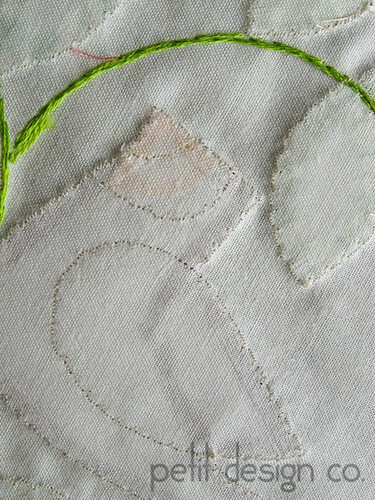 I then I use a machine appliqué method known as “invisible machine appliqué” to stitch down my fabrics. As you can see from the picture above, it almost looks like needle turn appliqué. I can share a quick tutorial if you are interested. The thread that you see is actually my bobbin thread that was pulled to the top. I kept trying to adjust the tension and couldn’t get it just right. This is the best I could do and it’s good enough for me! I really should change my bobbin thread to match what I’m stitching but that is a lot of thread changes! I still need to add the berries to the block but I need to go to the hardware store and buy some washers so that my circles will come out perfect! Your appliqué looks fantastic to me. I am hoping to make this quilt as well as soon as I finish up the soldier quilts I am working on. Great job! 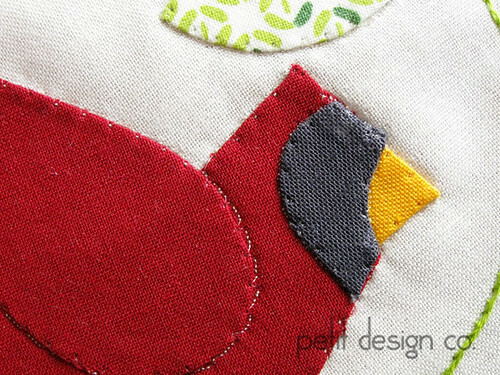 I would love to know how you do this because it definitely looks like hand applique to me! Beautiful! Fantastic! 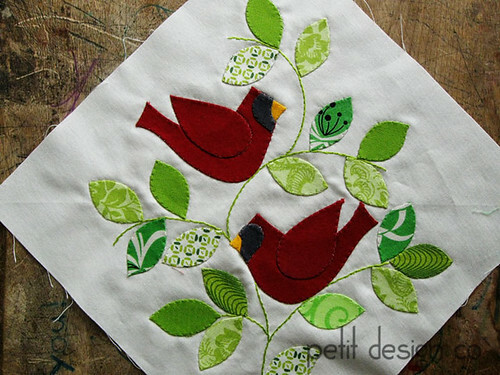 I would love to know how you did the machine applique; it's looks different from anything I've seen before. On another note, is the giveaway linky done forever? It says it's closed. Love your design, use of prints, colors. Great spacing and visual impact. Really beautiful. Really beautiful! I actually thought it was needle turn applique until I read your explanation. I would be interested in knowing how you did this--so much quicker than doing it by hand! I thought it was hand appliqued at first. You do excellent work. Looks beautiful, I love Erin's designs!